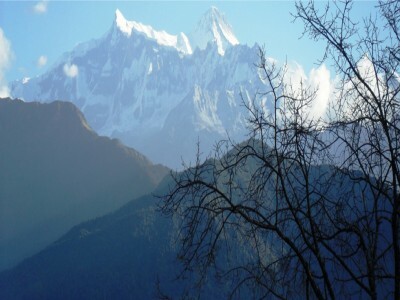 This Trek starts with an exciting flight from Kathmandu to Lukla, the Gate way to Mount Everest. In Namche Bazaar, the capital of Sherpa community, you will enjoy an opportunity to visit the Buddhist monasteries, the National Park head office, Museum. You will then visit the Everest View Lodge from where you can watch the panorama of mountains such as the Everest itself from a close range. You will trek back to Namche and then to Tengboche, Dingboche (4,358m/14,295ft), Chukung (4730m/1553ft), Kongma La Pass (5535m), Chola Pass (5368m), Renjo La Pass (5360m) and the Everest Base Camp (5,364m/17,598 ft). 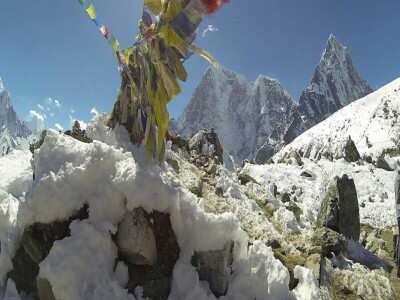 The major attraction of these three high Passes is the Chukhung valley is surrounded by Lhotse and Nuptse by the Lho Glacier and the Nup Glacier, Cho Polu and Baruntse by the Imja Glaciers, and the northern Mount Ama Dablam by the Ama Dablam Glacier and Chukhung Glacier. 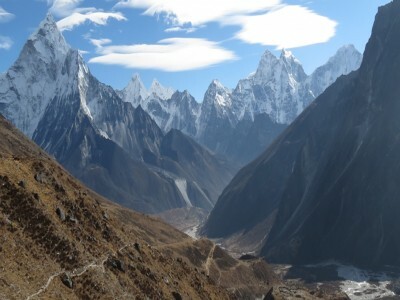 The other attractions are walking to the Ama Dablam Base Camp, and the Everest Base Camp. 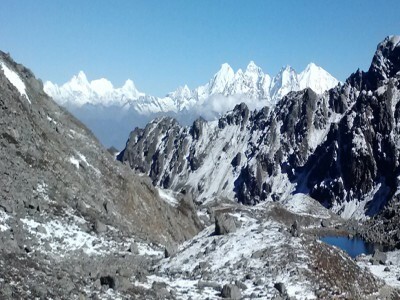 One of the most exciting treks in Nepal, the High Pass Trek is both adventurous and risky as well. First of all it can cause acute mountain sickness to the trekkers who have not acclimatized to the altitude. 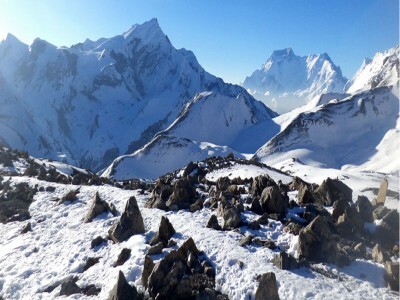 Hence acclimatization to the altitude is a must for trekkers. The other risk might be avalanche. During the climbing time you need trekking equipment like ropes, warm down jackets, trekking boots, trekking sticks, etc. 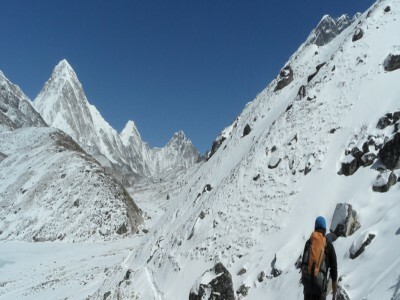 The crossing of the passes requires the use of technical climbing equipment and trekkers must have knowledge about that. Satori Adventures caters high quality service package to our clients. We provide hygienic and delicious food during the trek. More importantly, we serve you through some highly experienced Government-licensed trekking guides strong and experienced porters. The best seasons to trek in the high passes are spring (March to May) and autumn (September to November). Duration: 21 Days Elevation: (5420m/17779ft) Grade: Strenous Co-Ordinates: 28°00'23'' N / 86°51'438'' E Group Size: 01-10 persons per Group. 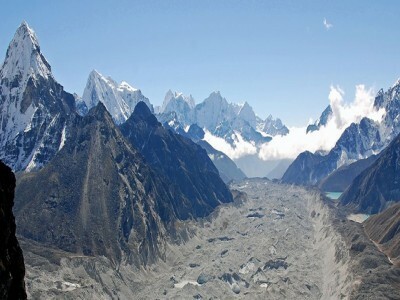 Duration: 15 Days Elevation: (4773M/15,657Ft) Grade: Strenous Co-Ordinates: 28° 15′ 0″ N, 85° 30′ 0″ E 28.25, 85.5 Group Size: 01-10 persons per Group. Duration: 21 Days Elevation: (5135m/16844ft) Grade: Strenous Co-Ordinates: 28.5500° N, 84.5575° E Group Size: 01-10 persons per Group. Duration: 15 Days Elevation: (5357m/17572ft) Grade: Strenous Co-Ordinates: 27° 59′ 17″ N, 86° 55′ 31″ E Group Size: 01-10 persons per Group. Duration: 28 Days Elevation: (5135m/16844ft) Grade: Strenous Co-Ordinates: 28.5500° N, 84.5575° E Group Size: 01-10 persons per Group. Duration: 19 Days Elevation: (5705m/18714ft) Grade: Strenous Co-Ordinates: 27° 59′ 17″ N, 86° 55′ 31″ E Group Size: 01-10 persons per Group.